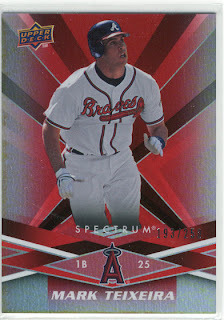 I need the 2009 Topps Heritage chrome refractor of Albert Pujols, so here is what I am proposing.... I have 2 chrome refractors of Pujols from last year, and I want to trade one for this years. This card is not for trade in any other instance, however I need to get my hands on the 2009 card. I am hoping someone out there has a double of this years, or has one they don't care about having to send my way. If you want a different card for it, by all means we can talk. Now, here is another card I have but want to trade... A Mark Teixeira 09 Spectrum Red /250 (card pictured for your viewing pleasure). Looking for a serial numbered Pujols from this set in return, or even the black or emerald Starquest cards from this year. There is a card show in my area next weekend, and I am hoping to go to that to pick up a few cards maybe. Man, that Spectrum Teixeira looks like it was updated from a rotisserie league message board. Braves uni, Angels card theme, and he's been a Yankee since just before Christmas. Why isn't this card covered in pinstripes?